At Eyemouth Harbour we welcome visiting leisure craft from all around the world. 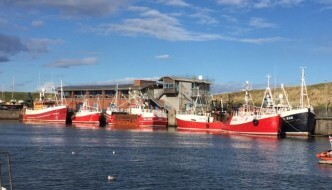 The harbour is also home to a number of commercial, leisure vessel operators who run a variety of trips or charters on the East Berwickshire coast and further afield. Whether you are embarking on a Round Britain sailing challenge or taking a more leisurely journey along the east coast of Scotland and England, make sure you stop off at Eyemouth. Our serviced pontoons provide fresh water and electricity, and offer sheltered mooring for your yacht just a few minutes-walk from the town centre. *vessels over 3m draft can be accommodated in our deep water basin, by prior arrangement with the Harbour Master. Please call the Harbour Master on 07885 742505 with any queries. Laundry facilities – 7kg capacity washing machine & dryer. Change/coins & washing powder available at EHT office. Take a look at our competitive rates & charges – discounts available for multiple nights.